Sprint has formally announced that the Palm Pre will be available on June 6th for $199.99 on a two-year contract, after rebates. Interestingly, that's two days before Apple's next big event and probable product launch. Also announced were the stores that'd be carrying it: far from a Sprint Store exclusive, the Pre will be sold in Best Buy, Radio Shack and Wal-Mart from launch day (a Saturday, oddly enough). You'll have to opt for an Everything Data plan or Business Essentials with Messaging and Data plan (both of which start at $70) to get one, and you'll have to send off a $100 mail-in rebate to knock the price down to the advertised $200, but otherwise, no surprises here. For those who juggle life circa 2009 – bouncing from conference call to car pool schedule, from doctors' numbers to doctoral thesis data, from social calendars to social networking – Pre marks a new wireless crossover standard. Before Pre, you had to compromise when selecting a wireless phone. To get the business features you needed, you had to sacrifice the personal entertainment features you wanted. Pre consolidates your important information – professional, social and personal – into one revolutionary device using an operating system that redefines the experience of living and working wirelessly. "The argument that you need one phone for work and another phone for play, or that you have to make compromises between business and lifestyle productivity, is over," said Dan Hesse, president and CEO of Sprint. "With Pre, compromises of the past are history." "The Palm Pre takes full advantage of Sprint's Everything Data plans," said Avi Greengart, research director for Consumer Devices at Current Analysis. "The Pre has been expressly designed for multitasking among multiple web pages and applications. It also builds on Palm's heritage in PDAs by managing your digital information – whether that's on a corporate server or on the web." "The Pre's dynamic 'activity cards' approach to handling and navigating multiple applications is a great advance, but the core breakthrough is the integration of information across multiple applications on and off the phone," said Andy Castonguay, director of Mobile & Access Devices Research, Yankee Group. "With social networking and messaging being so important to consumers, the device's new ‘Palm Synergy' functionality – which gives Pre the ability to automatically pull friends' contact details, messaging addresses and personal calendars from different applications online and on the phone – will greatly simplify people's ability to communicate with their friends and colleagues the way they want." The new webOS platform introduces Palm Synergy™, a key feature that brings together your personal and professional calendar, contacts and e-mail into one centralized view, making transitions between work and personal life smooth and easy to manage. * Linked contacts – With Synergy, you have a single view that links your contacts from a variety of sources, so accessing them is easier than ever. For example, if you have the same contact listed in your Outlook(3), Google and Facebook accounts, Synergy recognizes that they're the same person and links the information, presenting it to you as one listing. * Combined messaging – Synergy lets you see all your conversations with the same person in a chat-style view, even if it started in IM and you want to reply with text messaging. You can also see who's active in a buddy list right from contacts or e-mail, and start a new conversation with just one touch. 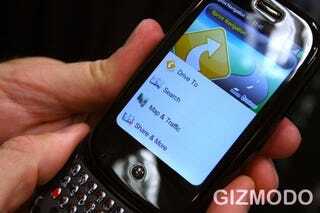 Palm webOS lets you keep multiple activities open and move easily between them like flipping through a deck of cards. You can move back and forth between text messaging and e-mail, or search the web while you listen to music. You can rearrange items simply by dragging them, and when you are done with something, just throw it away by flicking it off the top of the screen. Finding what you need is also easy with universal search – as you type what you're looking for, webOS narrows your search and offers results from both your device and the web. (4) WebOS crushes the barriers to true mobile computing. "Pre is truly a new phone for a new web-centric age," said Ed Colligan, Palm president and chief executive officer. "We're a mobile society, and we want our people, calendars and information to move with us. With Pre's exquisite design and the unique webOS software, running on Sprint's fast broadband network, we're changing the perception of what a wireless phone can be." Pre comes with a charger in the box, but for anyone tired of plugging a cord into their wireless phone, Palm introduces the Touchstone™ charging dock, the first inductive charging solution for phones, available exclusively for Pre. Simply set Pre down on top of the dock without worrying about connection, orientation or fit. Pre is active while charging, so you can access the touch screen, watch movies or video, or use the speakerphone. Set Pre on the charging dock when you're on a call, and the speakerphone automatically turns on; when you take a ringing Pre off the dock, Pre automatically answers the call. Other mobile operating systems allow multitasking, but Palm has developed an intuitive method of switching between "cards," which resemble clicking different tabs on a Web browser. New applications can be launched easily using the "Launcher" software button at the bottom of the home screen, and users navigate between different applications. With nearly every wireless device today you have to exit one application completely before you can use another. That's not what people are accustomed to; think of your PC and all the applications you can have open at one time. "Sprint's Now Network brings you America's most dependable 3G network, the largest push-to-talk community, and in selected markets Sprint is the only national carrier bringing 4G to life in 2009,"(6) Hesse said. "The Now Network is more than just a physical network – it's also data plans that are all-inclusive, eliminating fear of data overages and a perfect fit for Palm Pre users." Sprint's networks are now performing at best-ever levels, and Sprint's high-value Everything data plans consistently beat AT&T's and Verizon's comparable plans in savings by hundreds, even thousands, of dollars over two years. With the revolutionary launch of Ready Now, which Sprint pioneered, customers leave the store educated, comfortable and confident about the phones they're about to take home. As a result of these measures and more, Sprint customer satisfaction indices – from first call resolution to billing satisfaction, from customer care response time to service and repair – have all significantly improved during the past year. The Palm Pre phone will be available from Sprint on June 6 for $199.99 after a $100 mail-in rebate with a new two-year service agreement on an Everything Data plan or Business Essentials with Messaging and Data plan. An array of compelling accessories also will be available for Pre, including the Palm Touchstone charging dock. The Touchstone™ Charging Kit, which includes the Touchstone charging dock and Touchstone back cover for Pre, will be available June 6 for $69.99. The Touchstone charging dock and Touchstone back cover also are available separately from for $49.99 and $19.99, respectively. More information is available at www.sprint.com/palmpre.